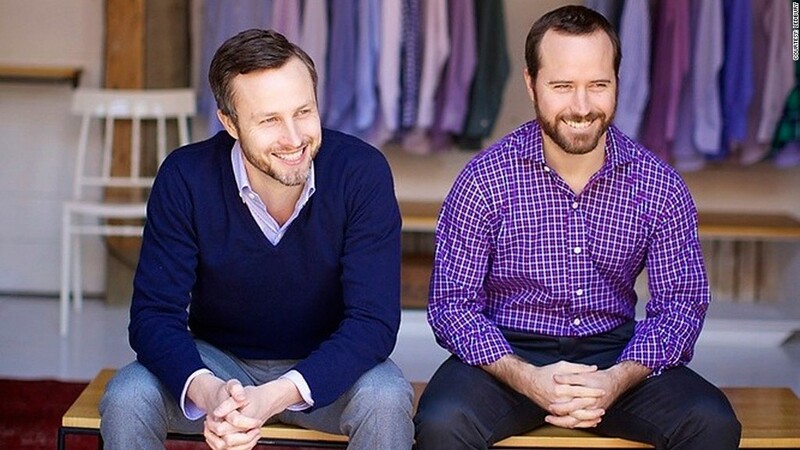 Paul Trible and Paul Watson launched their shirt company Ledbury four years ago. They're hoping to turn a profit by the end of the year. Paul Trible and Paul Watson graduated with their MBAs from Oxford on a September morning in 2008 with lucrative finance jobs waiting for them. Two days later, Lehman Brothers filed for bankruptcy and the financial world imploded. Their jobs disappeared, as did all the other jobs you're meant to take after business school. With little idea of what to do next, the two Americans, who had no capital and even less fashion experience, decided to take an apprenticeship with a well-known London tailor who had made shirts for them. Five years later, their shirt line Ledbury is about to turn a profit. Back in 2008, the tailor had the two 20-somethings start by taking a shirt apart and putting it back together. Trible's, he said, looked like an octopus. But nine months of choosing fabrics and sewing buttons later, Trible and Watson decided to create a collection of their own. They also scraped together a quarter of a million dollars from friends and family to fund it. "It was a time when people were taking money out of the market, and they wanted to put their cash into something that they could touch," Trible said. They came back to the U.S. in December 2009 and launched Ledbury out of an old tobacco warehouse in Richmond, Va. The shirts, which sell for between $125 and $165, are edged out variations on a classic button-down. The collars have an interlining that helps them stay up, the second button was moved a fraction of an inch lower to create a V at the neckline and the standard white shirt was made from ribbed extra-fine twill instead of plain cotton. Ledbury keeps its costs down by only selling through their website and not supplying to other retailers. Trible said the shirts would cost at least $225 if they were marked up in stores. The more modern modifications and the price point hit a sweet spot. For younger customers, Ledbury was more trend for their buck, and post-crash bankers who could no longer afford $400 shirts realized they could get high quality for one-third the price. "Guys who bought Canali and Zegna saw this quality for less and started asking why they had been spending so much money," Trible said. And it seems to be working. Ledbury is on track to sell 40,000 shirts and be profitable by the end of the year. That's double what it sold in 2012. Ledbury's also expanded beyond shirts to belts, ties, sweaters and blazers. While their belts are made in Virginia, all of the other items are made in Italy or Scotland. It's moving into pants next, and Trible is looking to source them from a manufacturer in Brooklyn. "We'd love to make more out of the U.S., but we just haven't found the right people. The real issue is scale," Trible said. As Ledbury grows to include new products, they're looking for new investors. As of September, they had raised about $2 million and plan to start a new round of funding next year. Trible and Watson have been traveling across the country pitching their sales growth to investors, but the success is still hard for them to wrap their heads around. Trible did a double take earlier this year when he saw someone wearing one of his shirts in the Atlanta airport. "I ran over to him and gave him a hug," he said. "I saw this thing when it started as a swatch. It's a pretty cool thing."